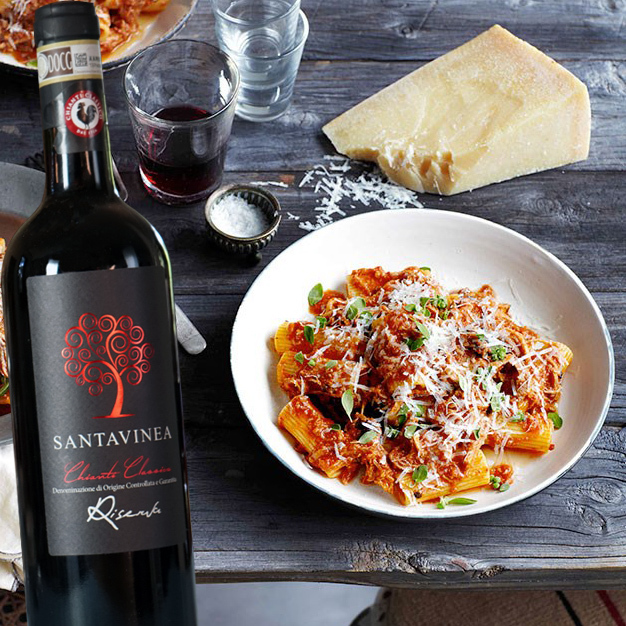 For your Sunday lunch we propose you Rigatoni with bacon, tomato and olives to pairs with Chianti Classico Riserva. Enjoy your meal! Preheat oven to 120C. Heat olive oil in a large casserole over medium heat, add onion, leek and celery and stir occasionally until tender (7-8 minutes). Add pancetta and stir occasionally until golden (6-7 minutes). Add Madeira, simmer until reduced by half (1-2 minutes), add crushed tomato, bring to the simmer, season to taste, add pork shoulder, cover and braise in oven, turning once, until very tender (3 hours). Remove pork and, when cool enough to handle, coarsely shred and set aside. Process cooking liquid in a food processor or mouli to a purèe, transfer to a saucepan over medium heat and simmer until reduced to a thick sauce (10-12 minutes). Stir in pork, olives, butter and marjoram, season to taste and keep warm. Cook rigatoni in a large saucepan of boiling salted water until al dente (6-8 minutes), drain, toss through pork mixture, and serve hot scattered with parmesan and extra marjoram leaves.